Eldorado, it seems, is a let-down. 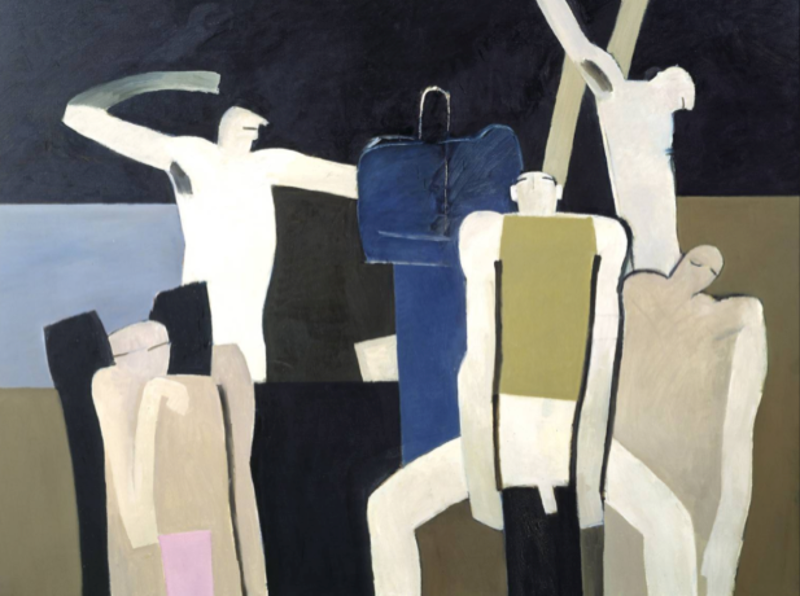 In Keith Vaughan’s picture, based on a disillusioned comment by Baudelaire, the men who have made it to this legendary land have the awkwardness of travellers who have taken a wrong turning…The figures that haunt the picture are faceless, landlocked and lacking definition. One, densely blue and apparently un-related to the rest, is positively perturbing. The burden of having nothing to do. Tried painting but the panel was ‘finished’ in half an hour and is quite trivial…There is not a single one of the paintings in my recent show that I would want to do again. Cannot now understand how they came to be painted, except the 9th Assembly which is a throwback to figuration. But the notion of painting bores me. It does more – it fills me with feelings of anxiety and mild panic. The idea that I shall never paint again. One can see why North Africa is the Eldorado Banal for so many. The offer of completely narcissistic relationships or rather narcissistic self-indulgence in the company of another – though it must be a sort of relationship…I have a great urge to try this just once. Vaughan’s Ninth Assembly of Figures – Eldorado Banal (1976), now in Tate Britain, was the last in the series of major ‘Assembly’ paintings. Painted in Vaughan’s Belsize Park studio one year before he died, the composition was taken directly from a small, highly finished but undated, pencil drawing. This was given to Professor John Ball and Dr. Gordon Hargreaves when they purchased the painting. Vaughan told them it was drawn much earlier and they dated it, on grounds of style, to c.1960-62. This is one of Vaughan’s finest and resolved large-scale figure works. In many ways the monumental composition is his comment on the position that he occupied in British Art during the 1970s. Being a painter who still believed in a handcrafted object, whose currency was the traditional subject of the human figure and who continued to apply pigment with skill and dexterity to the surface of a canvas, Vaughan now referred to himself as a ‘stranded dinosaur’ in an age of conceptualism and hard-edged abstraction. The pictures in Vaughan’s final Waddington exhibition took on new pictorial characteristics. His recent surgery and subsequent loss of libido not only diminished the quality and intensity of his sexual experience but also transformed his approach to painting and the appearance of his work. The sensual relationship that he had developed over the years with the painted surface and the act of applying paint, had in some ways been compromised; he had little choice but to somehow evolve a new manner of painting. A correlation certainly exists between Vaughan’s failing sexual responses and the disappearance of some of the more tactile and sensuous aspects of his painted surfaces; for him the act of painting in some way paralleled the sexual act. As his libido waned his canvases became more compressed and resolved and possess a more uniform and less varied picture surface than work from just one year earlier; the paint is thinner and more diluted. The phenomenon is directly related to Vaughan’s new identity as a non-sexual being. This is not to say that the late paintings were in any way inferior to the earlier work. On the contrary, Vaughan’s pronounced economic and chromatic use of colour demonstrates a highly satisfying distillation of his pictorial forces. His reduction of the illustrative qualities of his forms to near abstraction, as well as the use of increasingly refined arrangements in his compositions, helped to intensify and strengthen these paintings. Vaughan’s newfound clarity was not achieved with ease; on the contrary, his journal and studio notebooks are filled with discussions about how he might achieve a synthesis between the formal and the figurative qualities of his art. Eldorado banal de tous les vieux garcons. Regardez, après tout, c’est une pauvre terre. 16 March, 1977: I was very glad when Leslie [Waddington] told me you had decided to have the 9th Assembly. Two other people wanted it at the opening so I was particularly glad you got in first. It will certainly round out your collection. He also pointed out that the figure at the bottom left was a quasi self-portrait, explaining that his pictorial function was to act as mediator between the figures behind him and the viewer before him. He wryly muses that human desires and aspirations are a fantasy and a waste. Wherever this wretched province is situated, be it the land of regret, the terrain of old age or the galling territory of human disappointment, according to Baudelaire and Vaughan, Eldorado is actually the cul-de-sac of life, and a terrible let-down.